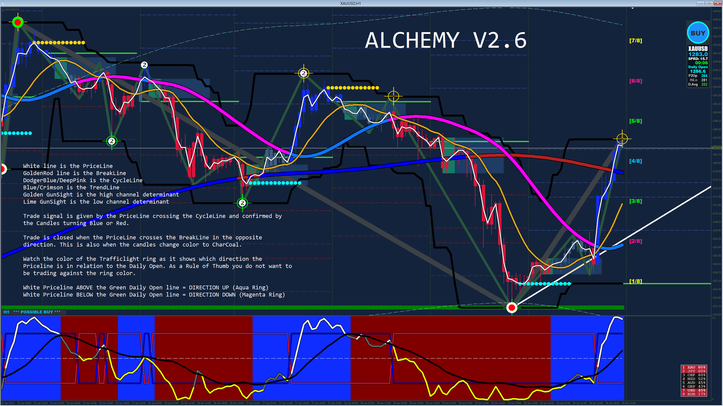 Alchemy is a trading system intraday trend following written by Xard777. the key to this trading system is the search direction of the day as a filter. White line is the priceline. Gold line is the brekline. Dodgerblue/Deep Pink is the Cycle line. Blue Crimson is the trend line. Golden Gunsight is the hig channel determinant. Trade Signal is given the Price line crossing the Cycle line and confirmed by the candles turning blue or red. Watch the color of the trafficlight ring as it shows which direction the pricelline is in relation to daily open. As a rule of thumb you do not want to be trading against the ring color. White price line aboove the green daily open line= Direction Up ( Aqua ring). White price line below the green daily open line= Direction down ( magentaAqua ring). It's a pity that the indicator sizing can't be reduced. Too many thick lines cover the price and the large semafor targets are annoying. What is the explanation of the oscillator in the lower window. This system labors the pc as it is, if an indicator has no explanation, why include it?